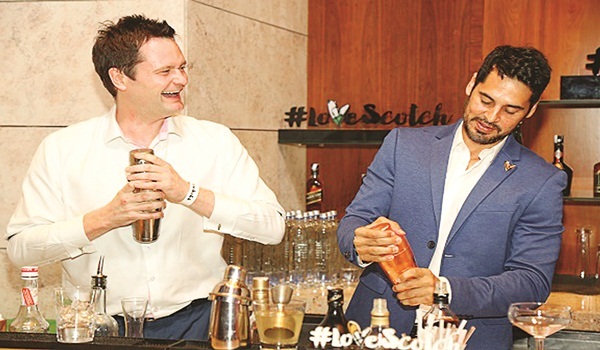 Canadian super model Coco Rocha, and A�Bollywood celebs Randeep Hooda, Mandira Bedi and A�Dino Morea made their way to this luxury hotel to celebrate A�World Whisky Day. The foursome talked about their favourite drinks and offered suggestions to each other. Hooda and Morea even got behind the bar to make cocktails with Diageo brand ambassadors, Jamie Walker and Nicholas Ord! They concluded the spirited evening with a pub crawl, covering Sanchos and Skyye at UB City. & Hill has spread its wings to Lavelle Road.The launch party last week saw attendees admiring the outlet, while chatting with the owners, over finger food and rounds of bubbly. converged at this popular restaurant for a Masterchef-themed gourmet experience. Hosted by Star World India, the event saw celebrity chef and restaurateur, Manu Chandra, conduct a masterclass of sorts covering various techniques of cooking from sous-vide to ceviche. Guests were seen nibbling on his exquisite creations while sipping on refreshing cocktails. For actor Randeep Hooda, who also owns Gurgaon Polo Club, Johnnie Walker is more than just a drink. a�?I have named one of my horses Johnnie Walker, because whenever I get on top of him, he walks around as if hea��s having a rather good time. Hea��s dark, and whisky coloured, and has won me many medals,a�? says Hooda, who also enjoys the occasional Scotch with his father, at home, and sometimes even on sets. Rabbit Club of New York, and Glendale in Scotland are his favourite bars, and he has rather fond memories of the latter. a�?I am one of those idiots who went to Glendale Bar in Scotland, and asked a bartender a�?Whata��s your local drink?a�� He looked at me, and said a�?Scotch!a�� I was like a�?Oh, yesa��,a�? recollects the actor.